Today was Trophy Dash day, a separate one-day mini-rally to get in the groove. IFF. The results of this day are also used if needed, as a tie-breaker for the main rally ahead. We stayed on course (Rule #1). We were more or less on time (more less and less more, actually). We scored 6 seconds late, then 11, 4, 2, and 17 seconds early in the five legs today. Many of the checkpoints came right after a sharp turn, where we always lose a few seconds, but I zoomed ahead to try and erase that delay (and maaaaybe overzealously, given the results). Our First Day’s Scores. Oh well, we never claimed to be Experts! So tomorrow we get serious, really. Meanwhile, we made it onto the first page (Of two pages: 53rd place overall, out of all 120). That’s a success if we just lower our definition of success to staying on the first page! 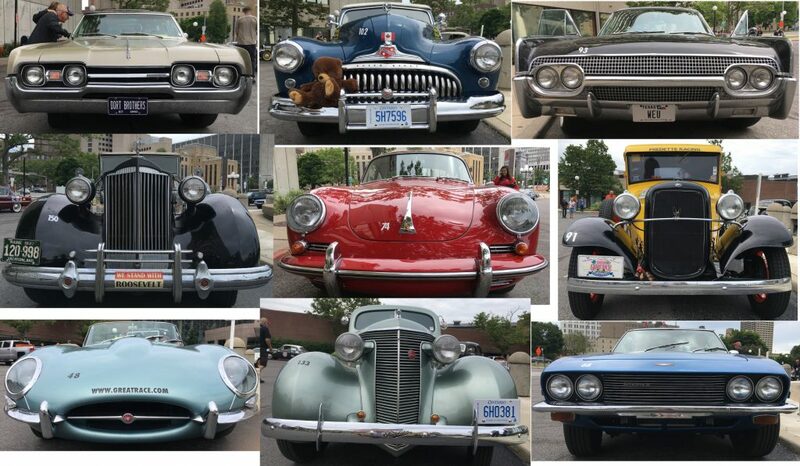 I thought it would be fun to show some of the variety of cars in an unusual way: some fo their ‘faces.’ Here is a selection: how many can you identify? Tonight, we had a superb lunch catered at Lockport, then a fine dinner at the Pierce-Arrow Museum. 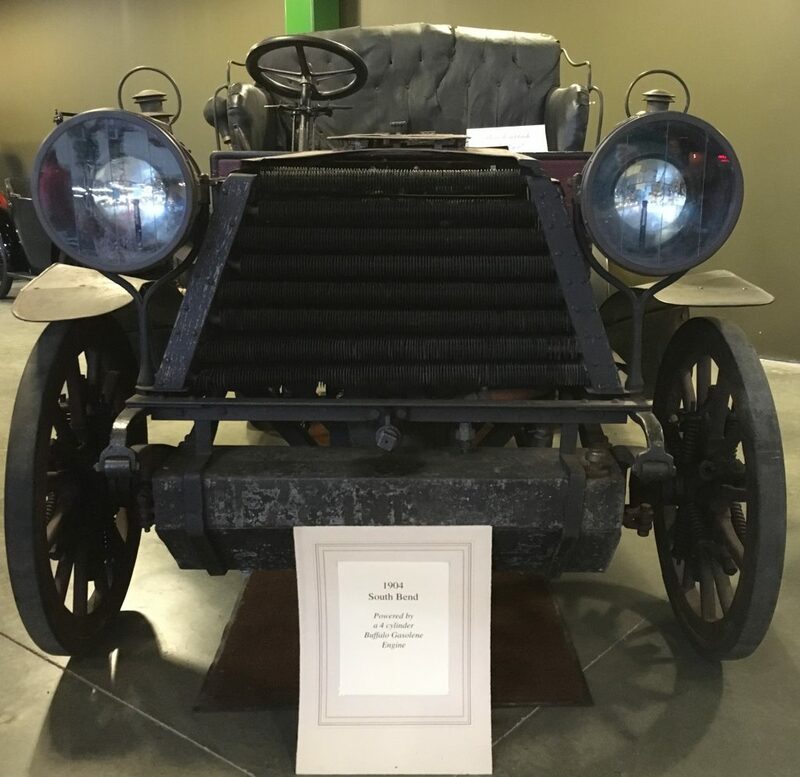 I didn’t realize how much overlap there was between Pierce, Thomas (winner of the original 1908 Great Race around the world), and Studebaker! Here are some pix of notable scenes and bits there. 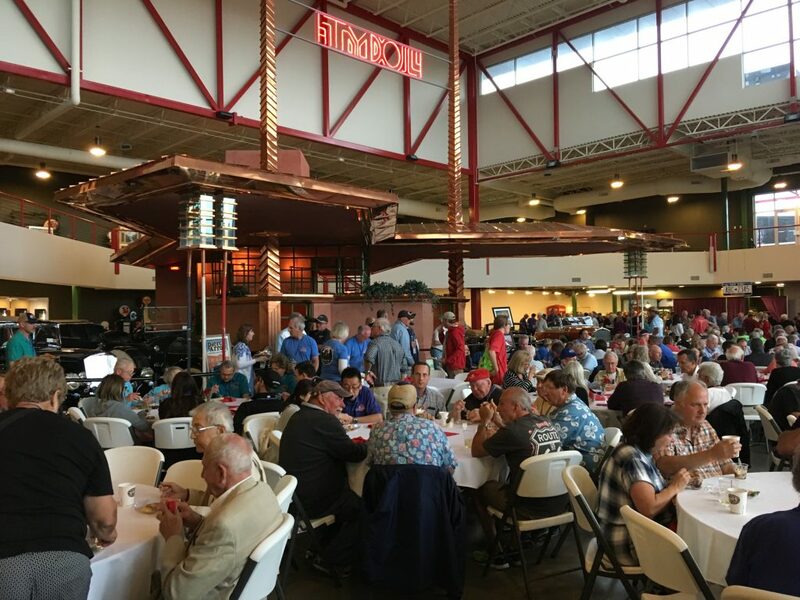 Dinner at Pierce Arrow Museum: GOOD FOOD! Great Cars! Cool Stuff! 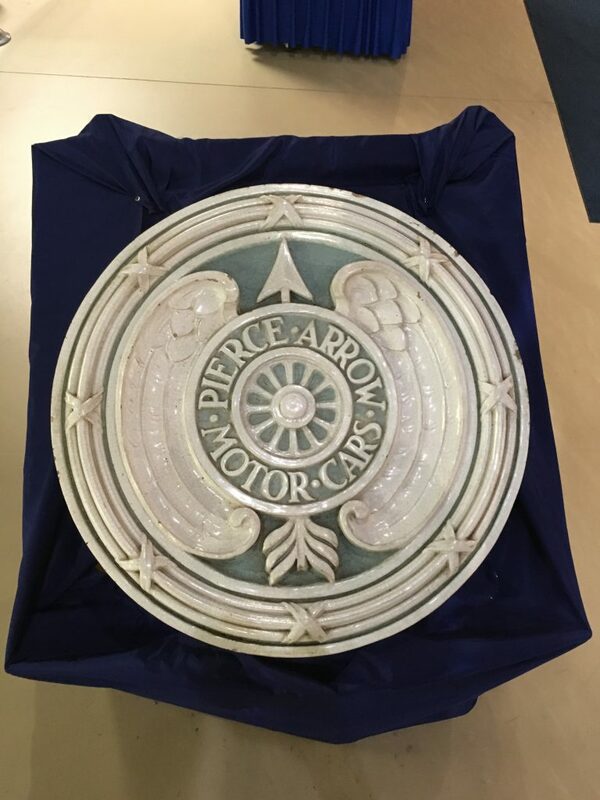 Architectural Medallion from the Pierce Arrow Factory (not a modern steel shed!). 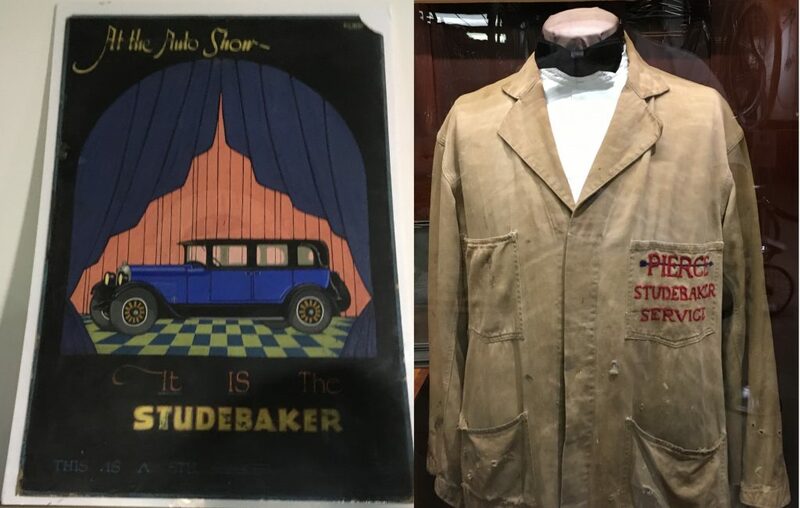 Studebaker Poster and Shared Work Jacket! Our Car is called ‘Bender’ mostly to honor South Bend, it’s city of manufacture (Yes, there are lots of sillier reasons, too). I never knew there was already a car called a South Bend, but there was one at the Museum today! South Bend car: the Original Bender? Off now for beauty rest. Tomorrow, it’s No More Mr. Nice Guy! We hope. I love the faces! And I certainly don’t count you as any less an expert. Nope, you don’t fool me! Was in Troy this AM. People are already camped on the streets hoping to get in good position for Bender and friends’ arrival tomorrow. Will see you at the Mt. Washington lunch break on Tuesday….with my 1965 Studebaker Cruiser….